"The policy of limiting the deductibility of even performance-based pay for CEOs has much to make it worthy of recommendation. Evidence strongly indicates that performance-based pay is not an efficiency enhancing institution that should be given preferential treatment in the tax code, so ending this preferential treatment is the rare provision in the TCJA that seems to make some economic sense. Further, ending the performance-based pay deductibility will raise a modest amount of revenue to roughly $9 billion per year (Balsam 2012). However, this analysis finds little evidence that ending the deductibility of performance-based pay will significantly affect the trajectory of CEO pay. We find no evidence that the provision of the ACA limiting the deductibility of CEO pay for insurers had any effect in reducing CEO compensation. 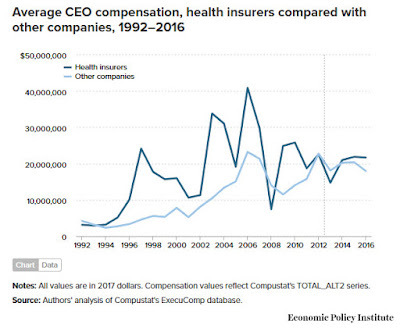 This would tend to support the view that CEO pay is determined much more by the power of CEOs in corporate decision-making than the returns they generate for shareholders since the change in tax treatment unambiguously raised the cost of CEO pay to the companies that employ them. This also suggests that efforts to rein in CEO pay by limiting deductibility more generally, as was done in the Tax Cut and Jobs Act of 2017, will not be effective. In order to limit CEO pay it may be necessary to alter the rules of corporate governance in ways that increase the power of shareholders over the CEO. This assessment must be qualified by the fact that our sample included a relatively small number of firms over a span of just four years"